Red Hat Cloud Suite is the first of what will be a family of Red Hat Suites, which are a combination of multiple Red Hat products optimized to work together and solve a specific customer scenario, with increased ease of use and management for customers. Read on for more information. 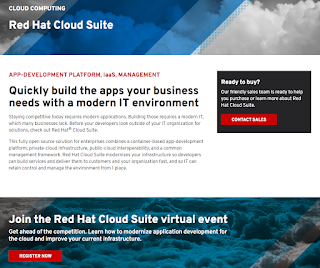 App Dev on the Red Hat Cloud Suite is the OpenShift Enterprise experience. In preparation for this product launch, we have been working hard to provide you with exactly that, the application developer experience. When you look at the product architecture and if you have followed the App Dev Cloud Stack series, you will find your window to the Cloud as an application developer is OpenShift Enterprise. We have been busy putting together the following example projects so that you can get a taste of the Red Hat Cloud Suite from the comfort of your own local machine, no data center needed. The window to this world for application developers is OpenShift Enterprise, so we have provided this through the Red Hat Container Development Kit (CDK) and JBoss middleware examples.